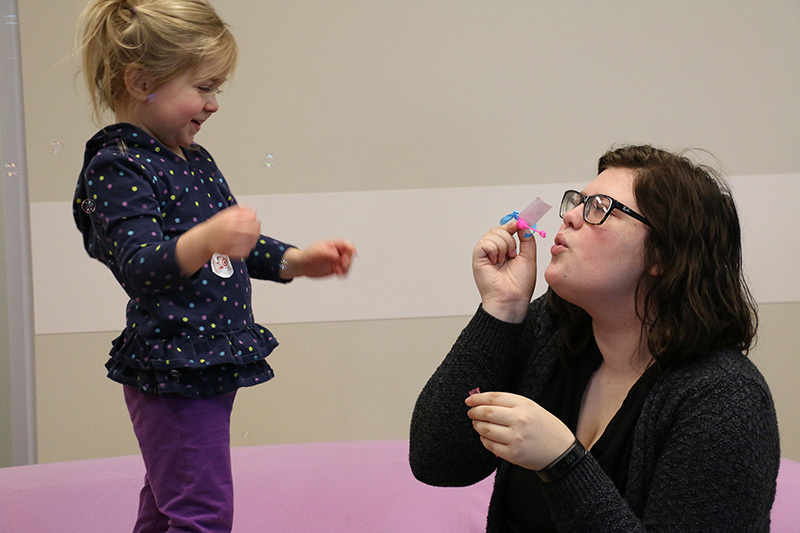 A preschooler and teacher candidate enjoy a playful moment during PLAY Day at Roskens Hall. 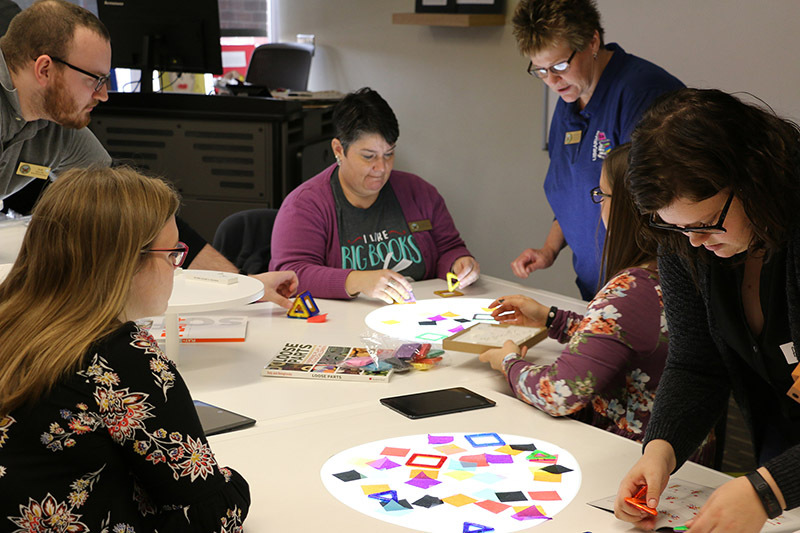 Omaha – PLAY Day, a day-long celebration of "play" happened Friday, Oct. 27, at a new learning space in Roskens Hall. The event marked the official grand opening of the Play Lab—an interactive, hands-on classroom specially designed to prepare aspiring teachers in the theory, science and application of play as an educational technique. Up-and-running as a classroom since August, the space encourages teacher candidates in Early Childhood Education programs to collaborate and explore in a space that reflects a real-world early childhood setting. 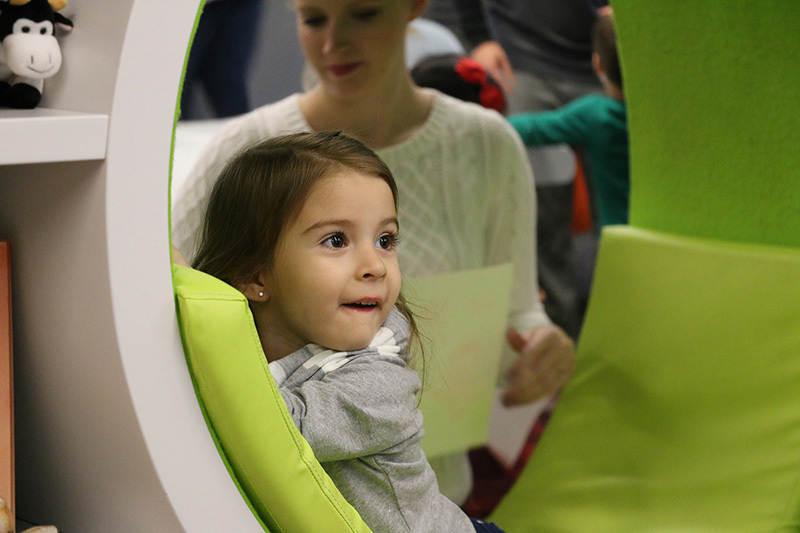 The Play Lab is the brainchild of Associate Professor of Early Childhood Dr. Debora Wisneski and Peggy Pawloski, a play environment designer and former kindergarten teacher. 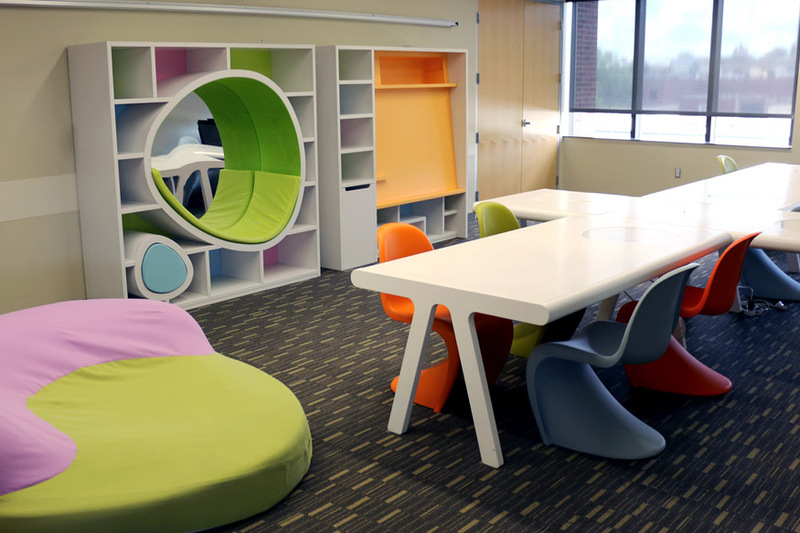 The non-traditional classroom features beautifully-designed furniture units, a puppet theater, comfy soft seating, and a communal workspace, all designed by Pawloski with the intent to bring "joy and playfulness to the work and school environment." According to Dr. Wisneski, "This is a space to move and to get to know each other. The Play Lab is a space congruent with their [teacher candidates'] future classrooms. 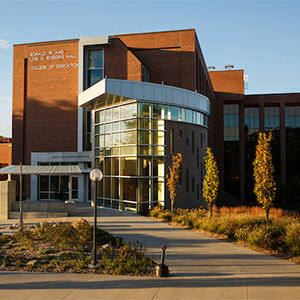 It’s a unique space for early childhood, and it offers a new approach to higher education. I believe it is the only classroom of its kind in the United States." Teacher Candidate Harley Thernka describes her experience as a student in the Play Lab, "It creates a sense of community. We use the entire space. With a traditional space, we tended to sit and stay at our own tables, now we mix up and 'play' with others." 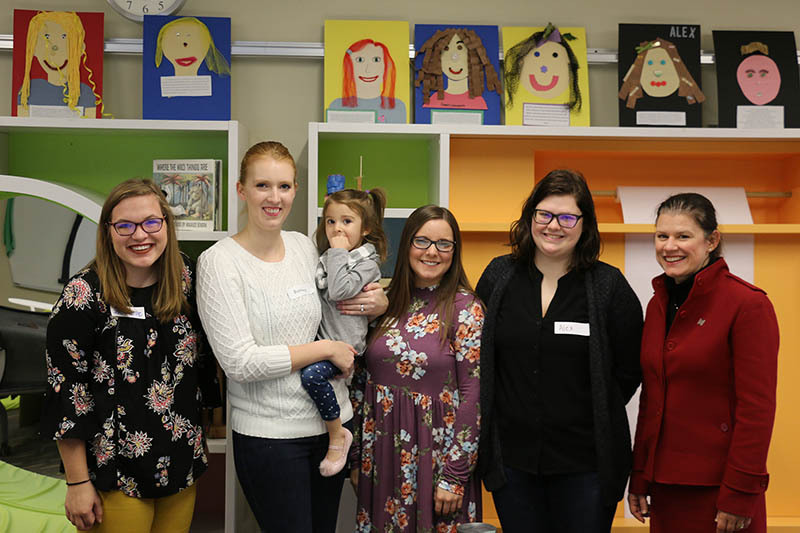 The PLAY Day grand opening event brought together College of Education faculty, staff, and teacher candidates; early childhood community partners; preschoolers and parents; and UNO early childhood donors. 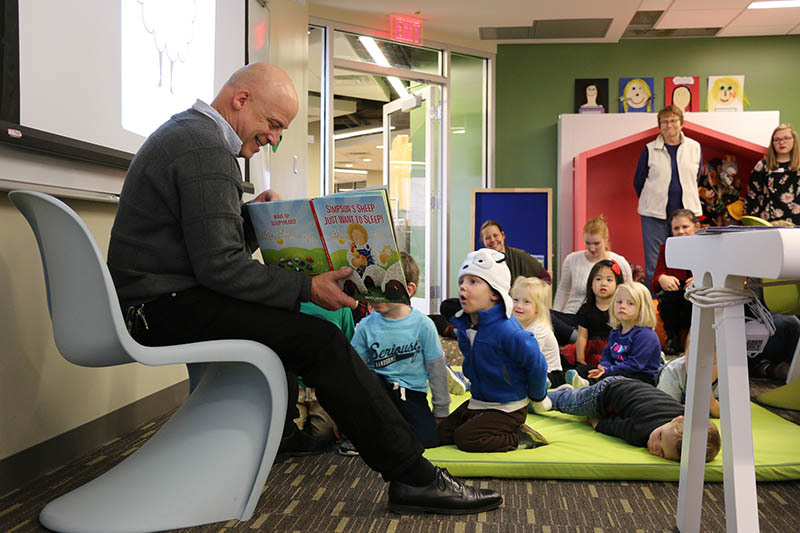 During the day-long open house, participants enjoyed presentations, free play time, and storybook readings by Bruce Arant, followed by a gratitude ceremony and reception. 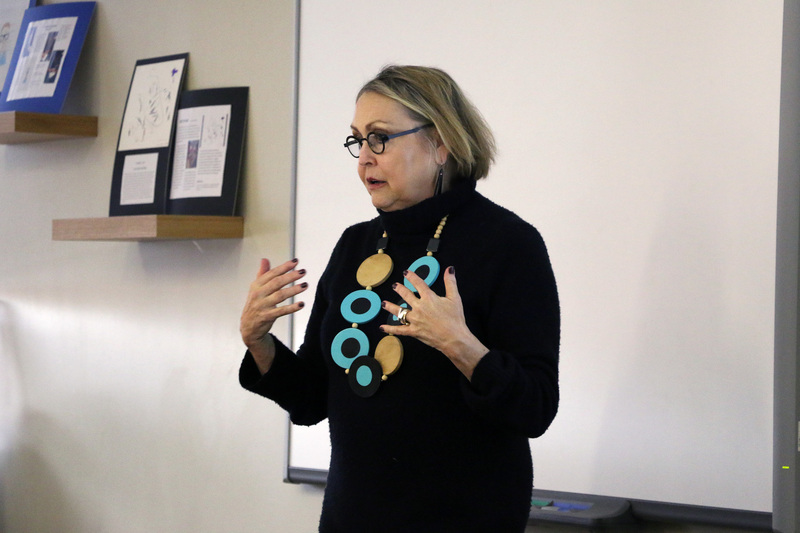 Donors honored at the gratitude ceremony included playground manufacturer BCI Burke Company, architectural firm RDG Planning and Design, Montessori expert and scholarship funder Dr. LaVonne Plambeck, and educational and play environment designer Pawloski. The open house event was made possible with grant funding by the US Play Coalition. 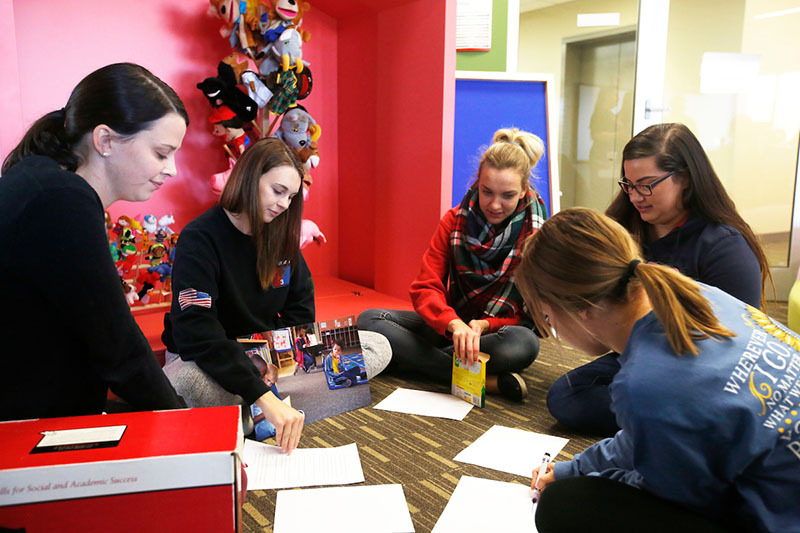 UNO teacher candidates now have the opportunity to collaborate and learn in a space that reflects a real-world early childhood setting. The Play Lab in August, before Fall classes began. Children’s book author and illustrator Bruce Arant reads to preschoolers from the UNO Child Care Center. A preschooler plays in the newly-designed Play Lab. Teacher candidates with Associate Professor Dr. Deb Wisneski (right). The nontraditional, communal work table with built-in light boxes inspires collaboration and interaction. Montessori expert and scholarship funder, Dr. LaVonne Plambeck (left), was honored at PLAY Day. 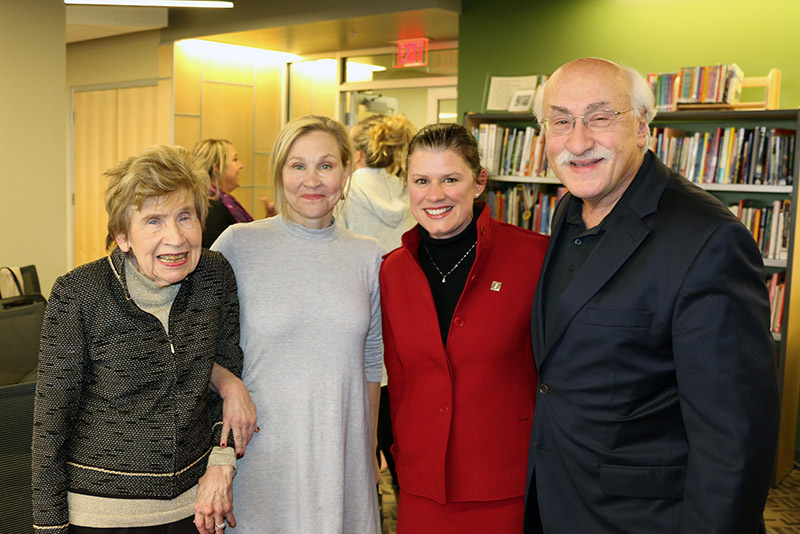 Dr. Plambeck is shown with daughter Pamela Plambeck, Associate Professor Dr. Debra Wisneski, and Founding Executive Director of the Buffett Early Childhood Institute, Dr. Samuel J. Meisels. Play environment designer Peggy Pawloski gives a presentation on the power of a well-designed educational space. The Play Lab was created with support from the PLAY Consortium Fund, a collaboration between community partners and donors, created to improve outcomes in early childhood through play research and outreach through the NU Foundation.